I have nothing but respect for the instinct that led to the above sandwich. I’ve eaten my fair share of questionable sandwiches, and each time I’ve spent time considering how things might be improved. More often than not, there’s a simple route. The McRib is a strong example here, where it’s only natural to look at that lackadaisical wonder of pork pricing and processing and think “Some quality ingredients, a little care, and this should be easy!” This is a very understandable impulse, and as it turns out, it is also very wrong. The Oinkster put together a big hunk of pork ribs on a bigger bun, with pickles and onions at once more plentiful than the actual McRib but still not plentiful enough. The pork was dry and a bit tough, and there was quite a bit more bun than there needed to be. It would be easy to say that they simply tried and got it wrong, but I think the issue here really is the format. After all, what’s the ideal here? Tender, pull-apart pork, to the edges or even spilling out of a soft bun, with a present but second-fiddle textural and flavor counter. In other words, a good pulled pork sandwich. No, I think this is a case where the baby ought go soon after the bathwater. 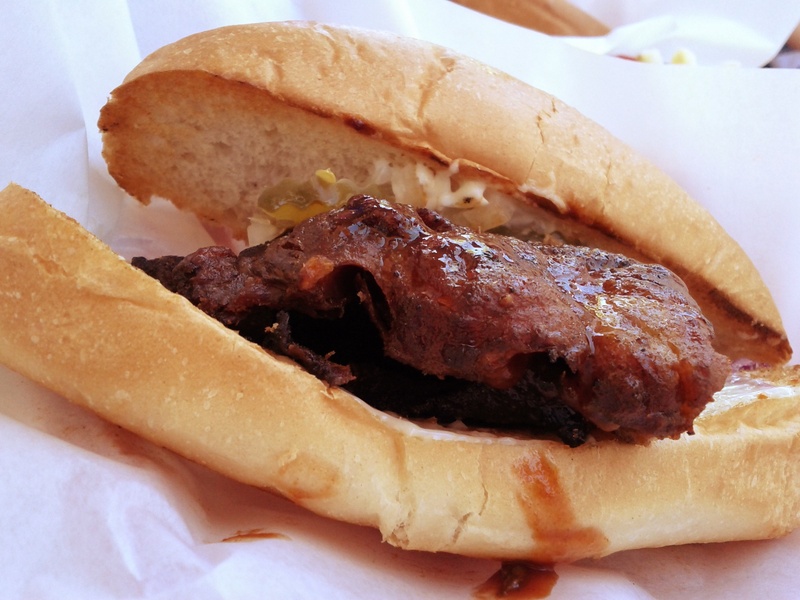 The McRib is the McRib for a reason, and there’s little reward in trying to gussy it up. This entry was posted in Sandwich Reviews and tagged Eagle Rock, Los Angeles, Pork, Reviews by Pete, The Oinkster by Pete. Bookmark the permalink.